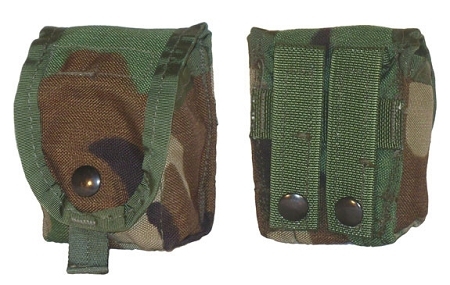 This pouch is designed to securely hold one hand grenade, and is designed for use with the MOLLE II system. It is water-repellent Cordura Nylon Canvas in a Woodland Camouflage pattern. The front flap features button closure with a quick-release pull tab. Metal Grommet drain hole on the bottom panel. It attaches via two reinforced webbing straps with button closure.